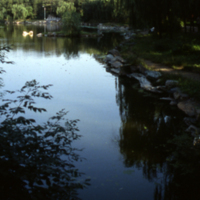 This collection consists of digitized transparencies taken in the fall of 1988 in and around the Beijing environs. 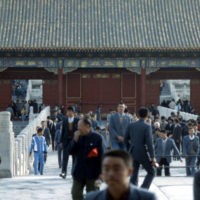 It includes images of common architectual sites like the Forbidden City, Temple of Heaven, Great Wall, Summer Palace and Ming tombs. 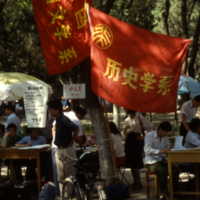 It also contains a fair number of images of city and (Beijing University) campus life. 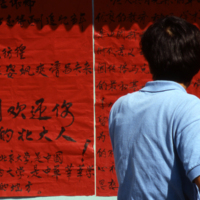 The latter might be of interest since this was the eve of the 1989 student movement. 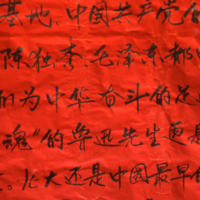 Additionally, there are a few images of Confucius' hometown and temple in Qufu, Shandong. 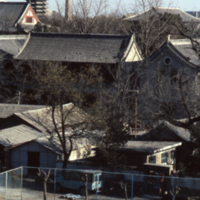 The photos in this collection were taken by Colorado College Professor of History John Williams. 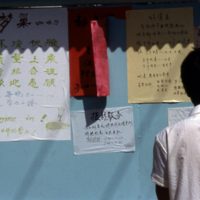 Beijing University student peruses flyers on a campus kiosk for a coffee house, photography service, and new books, among other announcements. 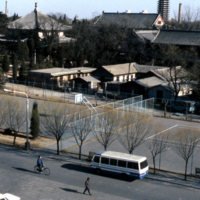 Traditional style architecture graces much of the Beijing University campus, viewed across the tennis courts fronting the foreign students' dormitory. 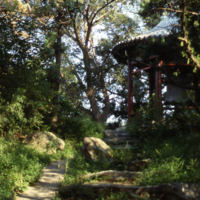 Through the trees surrounding Beijing University's Weiming Lake is seen the Bell Pavilion, built in the 19th century and once used to announce time on campus. 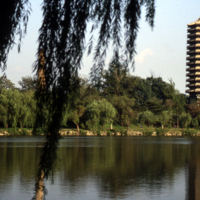 Weiming "unnamed") Lake and Boya ("Erudition and Elegance") Tower, the landmarks of the Beijing University campus. The lake dates to the 18th century, predating the university by more than a century; the tower dates to 1924, built to supply water.